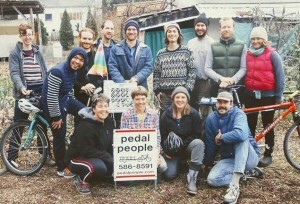 Pedal People Co-operative is a human-powered delivery and hauling service for items under 300 pounds in Northampton, Massachusetts, USA. Pedal People handles the trash and recycling of 5% of Northampton and started in December 2002 by Ruthy Woodring and Alex Jarrett and now we’re an incorporated cooperative business with ~20 members. Save 375,000 pounds of CO2 emissions annually – enough to fuel 31 cars. Prevent 130,000 pounds of compost from going to the landfill and using tax dollars. Be a part of the nearly half a million dollars they contribute to the local economy. piled by the Co-operative Economics Collaborative. We do pickups all by bicycle, all year round, at competitive rates – without the loud trucks or diesel exhaust fumes. “The Co-op uses bicycles and bicycle trailers to transport things, and is committed to using human power despite the culture of dependence on motorized vehicles. We hope that our use of relatively simple tools in sound business practice will debunk the prevailing belief that more technology is needed to solve problems. We believe that social change is possible, and we share inspiration and education with people wanting to choose more sustainable lifestyles. We aim to make a living in a fair, noble way, exploiting no one. Check out Ways to reduce trash!